Welcome to this year's 35th issue of DistroWatch Weekly! This week we are going to take a step away from the mainstream Linux distributions and focus our attention on lesser known open source operating systems and niche GNU/Linux projects. We begin with a quick look at two projects: Guix System Distribution, a project that combines a completely libre operating system with advanced package management ideas, and ReactOS, an open source operating system that strives for binary compatibility with Microsoft Windows. In our News section we discuss Valve making it easier for Linux users to transparently run Windows games and Haiku preparing for the project's first beta release. We also discuss Parabola replacing their archive manager and NetBSD 6 reaching the end of its supported life. We cover multiple queries in our Questions and Answers column this week, exploring how to merge hard drive partitions, finding an alternative distribution to Tails for secure web browsing and talk about the various tools for running programs as another user. Plus we are happy to share the new releases of the past week and list the torrents we are seeding. Finally, we are pleased to welcome Hamara, a Debian-based distribution, to our database. We wish you all a terrific week and happy reading! Listen to the Podcast edition of this week's DistroWatch Weekly in OGG (16MB) and MP3 (13MB) formats. A few readers have asked me this month to talk about some less commonly discussed open source operating systems. With that in mind, I decided to review the latest versions of Guix System Distribution (a Linux distro with an unusual package manager), and ReactOS (an open source project that tries to be binary compatible with Microsoft Windows). Guix System Distribution (GuixSD) is a Linux-based operating system that is built around the GNU Guix package manager. The operating system provides advanced package management features such as transactional upgrades and roll-backs, reproducible build environments, unprivileged package management, and per-user profiles. This description may seem familiar as GuixSD shares several features with NixOS, which is a platform built using the Nix package manager that offers the same feature set. GuixSD is developed by the GNU organization and strives to respect users' software freedoms. Naturally, it is one of the few Linux-based operating systems on the GNU project's list of completely free operating systems. GuixSD is available in 32-bit and 64-bit builds. The compressed ISO file we download is 186MB in size and, when it has been expanded, it grows to 986MB. Booting from this media brings up a text console where we are automatically logged into the root account. A message on the console lets us know we can access local documentation by pressing ALT-F2. The welcome message also tells us GuixSD is still in development and concludes by stating: "Thanks for being so brave." The documentation provided explains some limitations of GuixSD, such as not having non-free firmware for wi-fi devices. The documentation Includes networking instructions, a guide explaining how to partition the disk and set up file systems prior to attempting to install the distribution. These instructions are also on-line in the Guix manual. To install GuixSD we first need to partition the hard drive, probably by using the cfdisk command line partition manager. We then format the root partition and mount it under the /mnt directory. We then run the command "herd start cow-store /mnt". The next series of steps gets us to copy the standard configuration file to the /mnt/etc directory and edit the file to customize the system. This includes selecting the location of the boot device, changing our username, selecting which desktop environment to use and any necessary encryption mappings. Once the configuration file has been adjusted to our satisfaction we then run the command "guix system init /mnt/etc/config.scm /mnt" to set up the operating system. Here is where I ran into a wall with GuixSD. I tried five different attempts at setting up the template file to match my settings (plus one attempt where I just accepted all the defaults to see what would happen) and the process failed each time. Typically the guix command would exit with a cryptic message indicating a syntax error in the file. Unfortunately the errors were not helpful and I found no relevant trouble-shooting steps in the documentation. I was a bit disappointed with running into this barrier. I've installed NixOS a few times and like the idea of a central configuration file that can manage users, services and installed packages. The concept is one that appeals as it makes it easy to for an administrator to re-create the same operating system procedurally across multiple machines. I am sorry to say I did not have the same success setting up GuixSD as I have had with installing NixOS in the past. It has been about two years since I last reviewed ReactOS. Since then, the ReactOS team has been putting work into making their operating system self hosting (it is possible to develop and build ReactOS on ReactOS). Windows application support has gradually improved and the latest version of the operating system supports opening Zip files as folders, the way Windows XP and later versions of Microsoft's platform do. ReactOS is available in two editions: a Live edition for testing the operating system and its compatibility with our hardware, and an installation disc. Both editions are compressed with the Live edition starting at 74MB and expanding to 235MB, and the install disc is a 104MB download which expands to 124MB. I got off to a rocky start as the Live edition would not boot in VirtualBox, with or without debug options enabled. I also could not get the Live edition to boot on my laptop. A boot screen would appear and ask me to press a key to boot from the ReactOS media, but pressing a key produced an error indicating no boot media could be found. It is an odd error since the prompt itself was coming from the boot media. I then changed gears and tried the install disc in VirtualBox. The installer should look familiar to people who have installed earlier versions of Windows, such as versions 2000 and XP. We are shown a blue text screen with a series of simple menus. The installer asks us to select our language and screen resolution from lists. We are then guided through partitioning our hard drive. The partitioning options are fairly limited as ReactOS only wants one partition and it should be formatted with the FAT file system. We are then asked if we would like to install a boot loader. The whole setup process only took me about two minutes. The first time we boot into the new copy of ReactOS a graphical wizard appears and asks for our location information. We are also asked to provide a password for the administrator account and select our time zone from a drop-down list. We can choose between two themes, one which resembles Windows 2000 and the other which has a similar style but with darker elements. We can then optionally join a Windows domain. There is, by default, no login page. When the operating system boots we are brought straight to the desktop and given the ability to perform administrator tasks. The desktop closely resembles that of Windows 2000 or 98, with a similar file manager, application menu, control panel and driver management. The faithfulness of the recreation is impressive. The desktop was generally responsive, though the interface tended to lock up temporarily whenever the disk was being heavily accessed. My main issue though was not waiting for disk input, but dealing with instability. When running in VirtualBox, ReactOS tended to crash whenever I was running more than two or three programs at a time. Sometimes this manifested in the desktop no longer responding to mouse or keyboard input and, in one case, ReactOS showed me the familiar blue screen of death. A problem I ran into early on was ReactOS could not work with my virtual machine's network card. Searching through the project's documentation I found instructions for setting up an adaptor the operating system would work with. 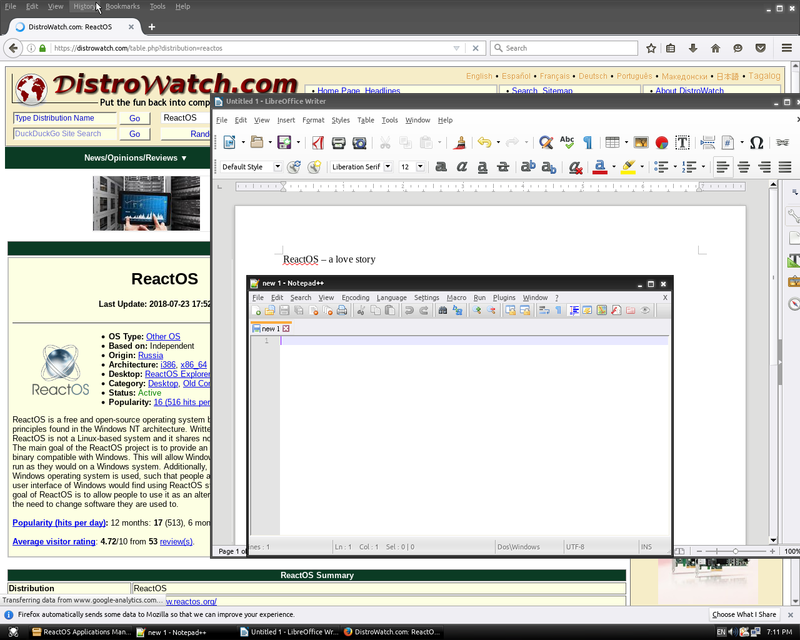 I switched out the network interface and rebooted, but ReactOS still did not recognize the virtual card. Since installing ReactOS takes just a few minutes and trouble-shooting would take longer, I simply re-installed the system with the new network card and it was properly detected after the fresh install was finished. One of the key highlights of ReactOS, in my opinion, is its package manager. 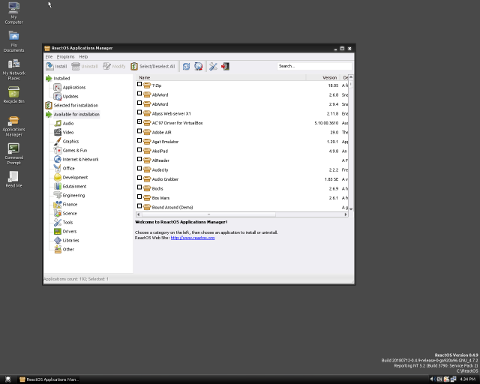 The system ships with a third-party application manager which can be accessed from a desktop icon. Programs are divided into categories we can browse through and we can check boxes to queue programs for installation. The package manager worked well and provided me with quick and easy access to a range of popular open source programs and drivers, including LibreOffice, Firefox, VLC, Notepad++ and a handful of games. A software centre that can run batch jobs to install multiple items at once is something I feel was notably missing from older versions of Windows and I really like that ReactOS makes downloading third-party software so straight forward. A big question people have when it comes to using ReactOS is whether the operating system really can deliver on the idea of running Windows applications. During my brief trial I found that it could. Each of the programs I tried ran and I typically found performance was better under ReactOS than I have experienced with recent versions of Microsoft's product. While both of the projects I experimented with this week are driven by very interesting concepts (GuixSD offers a purely free system with advanced package management and ReactOS attempts to be an open source replacement for Windows) there are limiting aspects to both projects which would keep me from running them on a regular basis. GuixSD has a package manager that I like. I've used related technology through NixOS in the past and loved how easy it was to rollback problems, manage accounts and skip forward or backward instantly through installed package versions. Where I feel GuixSD let me down was in its limited hardware support (there are no non-free drivers or firmware) and its limited documentation. There are instructions for using GuixSD when all is going well, but nothing I felt was helpful when the package manager was not operating the way I expected. ReactOS, while a completely different operating system with its own kernel, installer and programs, ultimately had a similar problem: limited hardware support. The operating system's Live edition did not work in either of my environments and I had to work around having a limited set of drivers. Another issue with ReactOS was the stability. The system tended to lock up if more than a few programs were running, or if I tried to cancel an intensive task like installing a new application. Both of these projects present interesting ideas, however both are still (as their documentation pages point out) in an unstable stage of development. They should be used with caution and probably not as a main, day-to-day operating system. People who would want to play games, including more mainstream titles, on Linux received good news this week. Valve, the company which develops SteamOS and the Steam gaming portal, has published a new beta of Steam which will allow Linux users to run some Windows games through a compatibility layer. The beta supports running 27 Windows games on Linux as though they were native applications with support for more titles expected to be added over time. Valve's announcement reads: "So, two years ago, we started an effort to improve the quality and performance of Windows compatibility solutions for Steam games. A lot of our work has been in the form of supporting WINE and other existing compatibility projects. We have also been integrating these tools into the Steam client to provide the same simple plug-and-play experience offered by regular Linux games. Our goal for this work is to let Linux Steam users enjoy easy access to a larger back catalog. We think it will also allow future developers to easily leverage their work from other platforms to target Linux." The Haiku project has been working on an open source continuation of BeOS for several years. The project is nearing a new milestone: the operating system's first beta release. A blog post on the Haiku website reports: "At last, R1/beta1 is nearly upon us. As I've already explained on the mailing list, only two non-'task' issues remain in the beta1 milestone, and I have prototype solutions for both. The buildbot and other major services have been rehabilitated and will need only minor tweaking to handle the new branch, and mmlr has been massaging the HaikuPorter buildmaster so that it, too, can handle the new branch, though that work is not quite finished yet. So essentially all that stands between us and the release itself is a lot of testing, and more testing, and polishing all the little bits and pieces we've neglected along the way. I've already begun drafting the release notes, and the i18n translation tools have been synchronized with master, so even though the string freeze hasn't happened yet, the bulk of the translation work can begin." The beta release is expected to be publicly available around the middle of September 2018. The Parabola GNU/Linux-libre developers have announced that they are replacing the unar archive manager with an alternative utility called unarchiver. "The unar package has been dropped in favor of Arch Linux's unarchiver. This was discussed in the mailing list some months ago. If you are using unar, just install unarchiver. You'll be asked if you want to replace it, just accept and continue as any normal package installation." The NetBSD project has announced support for the NetBSD 6.x series of releases has been discontinued. NetBSD users are advised to upgrade to either version 7 or 8 of the operating system. "In keeping with NetBSD's policy of supporting only the latest (8.x) and next most recent (7.x) major branches, the recent release of NetBSD 8.0 marks the end of life for NetBSD 6.x. As in the past, a month of overlapping support has been provided in order to ease the migration to newer releases." Coming-together asks: Is it possible to merge two partitions into one big partition? Back up all your files on the disk you are changing. Partition management can be destructive. Remove one of the partitions you want to merge. Expand the second partition so it takes up all of the space freed by removing the first partition. At this point you will have one big partition where you once had two small ones. At that point you can copy your data files back onto the one large partition from your backup. Avoiding-systemd-and-desiring-privacy asks: Has anyone made a systemd-free version of Tails? DistroWatch answers: People have made something which is similar to Tails that does not include systemd. The project is called heads and is based on Devuan. Like Tails, the heads project ships with Tor included by default. The heads distro ships with free software only, which makes it possible to audit all of the operating system's parts, but reduces the number of hardware devices heads can use compared to Tails. su-su-sudo asks: What is the difference between using su, su - and sudo? DistroWatch answers: The su command lets one user become another user. By default the su command will attempt to switch from the current user to the root user, though we can try to become any user if we have their password. When using plain su the current environment variables are maintained. Basically, when we use su the shell's variables stay the same as they were before we ran su. When we use su - the su command sets up the shell environment as though we had originally logged in as the specified user. It would be just like we had logged out and then signed in as a different user. The sudo command is a bit different. While su is typically used to switch our current command line user to a different user and remain logged in as that user, the sudo command is usually used to run just one command as another user. The sudo command typically is used to run one program as the root user without us signing into to the root account. The sudo approach has some advantages. It is flexible and can be tweaked to easily allow certain users or groups to perform specific tasks. The sudo command can provide logging, making it possible to audit a user's actions. When using sudo we do not switch to another user and so we avoid accidentally running future commands as the wrong user, which can happen if we use su and then forget which user we are signed in as. The deepin project has published a new release of its Debian-based distribution featuring the Deepin Desktop Environment (DDE). The project's latest release, deepin 15.7, focuses on optimizations and reduces the size of the distribution's ISO, and lowers memory consumption and power consumption. "To reduce power consumption of laptop, 'power saving mode' is added in deepin 15.7. Your laptop can enter power saving mode automatically when using battery. In this way, laptop standby and working time is increased. Preliminary tests show that in our test environment, standby time is extended 20%. deepin 15.7 has made a series of adjustments and optimizations in memory usage. In the standard configuration, the boot memory has decreased from 1.1GB to 830MB, and reduced to less than 800MB on a discrete graphics card." Further information, along with screen shots, can be found in the distribution's release announcement. Jeff Hoogland has announced the release of Bodhi Linux 5.0.0. Bodhi Linux is a lightweight Ubuntu-based distribution featuring Moksha, an Enlightenment 17-based desktop environment. The project takes a decidedly minimalist approach by offering modularity, high levels of customisation, and choice of themes. "Today I am very pleased to share the hard work of the Bodhi Team which has resulted in our fifth major release. It has been quite the journey since our first stable release a little over seven years ago and I am happy with the progress this projected has made in that time. For those looking for a lengthy change log between the 4.5.0 release and 5.0.0, you will not find one. 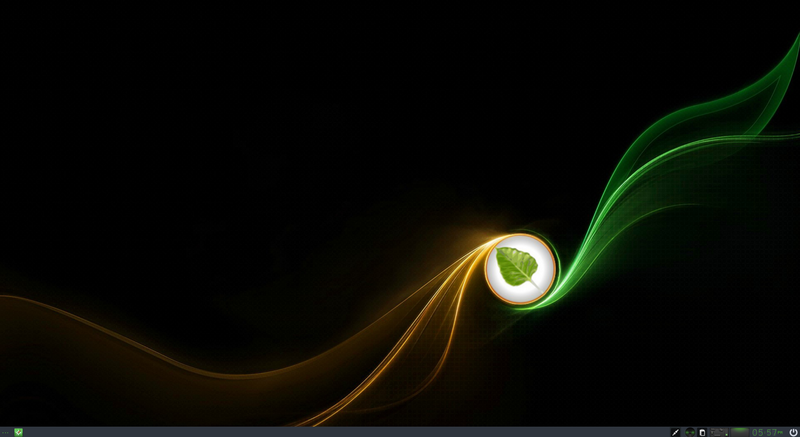 We have been happy with what the Moksha desktop has provided for some time now. This new major release simply serves to bring a modern look and updated Ubuntu core (18.04) to the lightning fast desktop you have come to expect from Bodhi Linux." Information on the new version can be found in the project's release announcement. The distribution is available in three editions: Standard, Legacy (for older, 32-bit computers), and AppPack which includes more software on the installation media. 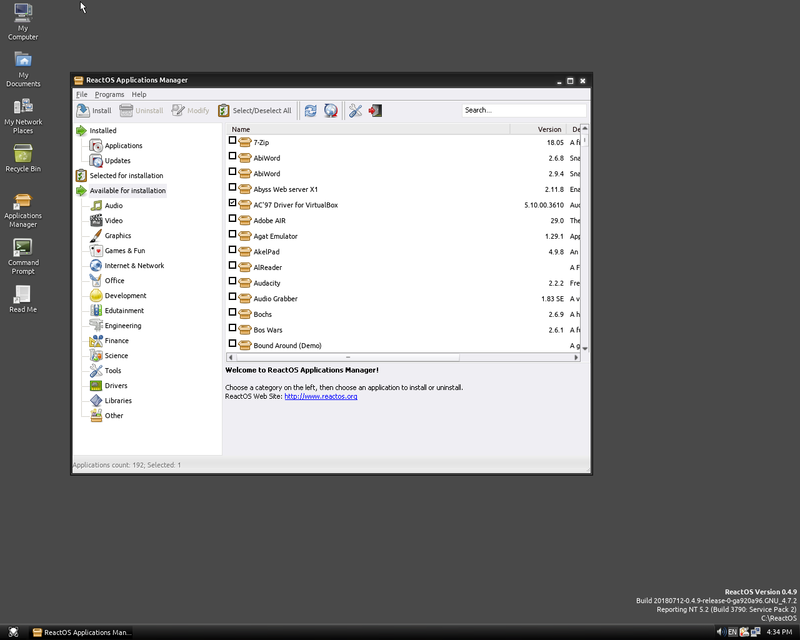 GParted Live is a minimal Linux distribution which runs a light desktop environment to provide access to disk partitioning tools, in particular the GParted disk management software. The project's latest version, GParted Live 0.32.0-1, is based on Debian's Unstable branch and includes fixes for shrinking LVM volumes and respecting minimal file system sizes. The release announcement states: "This release includes GParted 0.32.0, updated packages, and other improvements. Items of note include: Includes GParted 0.32.0 which adds the following enhancements: Implement opening and closing of LUKS mappings. Fix can't shrink LVM partition due to pvresize prompt. Recognise additional GRUB2 core.img signatures. Honour resize2fs minimum FS sizes. Based on the Debian Sid repository (as of 2018/Aug/23). Linux kernel updated to 4.17.17-1. This release of GParted Live has been successfully tested on VirtualBox, VMware, BIOS, UEFI, and physical computers with AMD/ATI, NVIDIA, and Intel graphics." The UBports project maintains a community-developed continuation of Canonical's Ubuntu Touch operating system for mobile devices. The UBports team has published a new major release, based on Ubuntu 16.04. The new release, UBports 16.04 (also known as UBports OTA-4), includes new power saving features, new keyboard layouts for Turkish, Bulgarian, and Swiss-French languages, and performance improvements. "After eight months of work, the UBports Foundation is proud to announce the release of Ubuntu Touch OTA-4. This release features Ubuntu 16.04 as its base (previously 15.04), bringing security fixes and greater stability to unseen corners of the operating system. We've also upgraded from Qt 5.4 to 5.9, bringing a number of improvements. Check out the What's New section below for more information on what's been changed or updated in this release! Users who have Ubuntu Touch OTA-3 will not be receiving this update automatically. See 'How do I get it?' below for more information. Why does OTA-4 matter? We believe that this is the 'official' starting point of the UBports project. From the point when Canonical dropped the project until today, the community has been playing 'catch up' in development, infrastructure, and community building. This release shows that the community is soundly based and capable of delivering." Further details can be found in the project's release announcement. A list of supported devices and installation instructions can be found on the project's Devices page. When it comes to performing administrative tasks on Linux, there are a few different common approaches. One is to use the sudo command to temporarily gain access to run a single command. Another is to use the su command to switch to a privileged user account and run commands interactively. When it comes to managing your computer system, which approach do you use? You can see the results of our previous poll on limiting process resource usage in last week's edition. All previous poll results can be found in our poll archives. 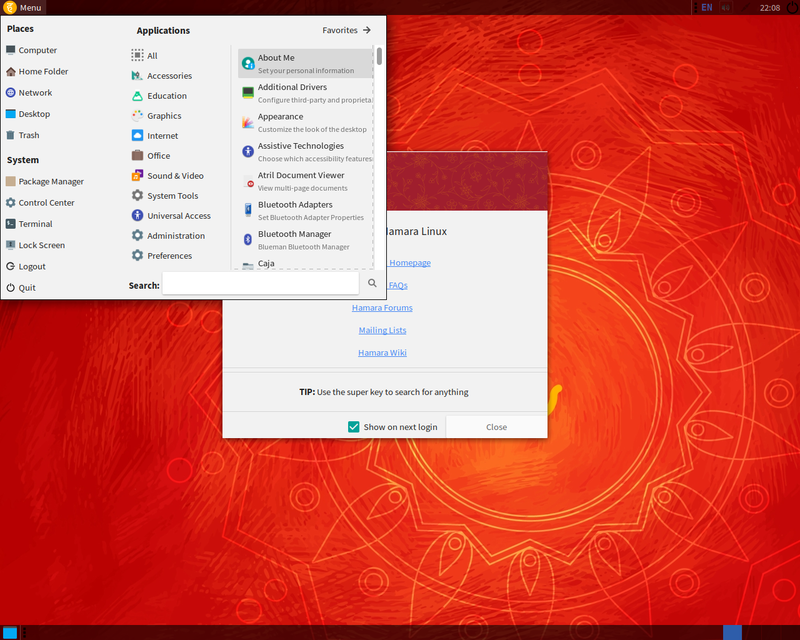 Hamara is a Debian-based desktop distribution featuring the MATE desktop. Hamara is developed in India and the team works to provide improved translations for the more popular spoken languages in India. Downloading and using Hamara can be done free of charge though the company behind Hamara also provides commercial technical support. Norcux OS. 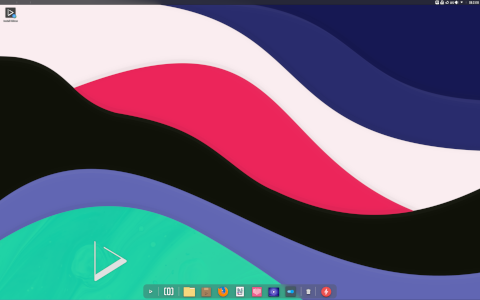 Norcux OS is a Linux distribution with two main branches: a fixed release based on Debian and a rolling release based on Arch Linux. 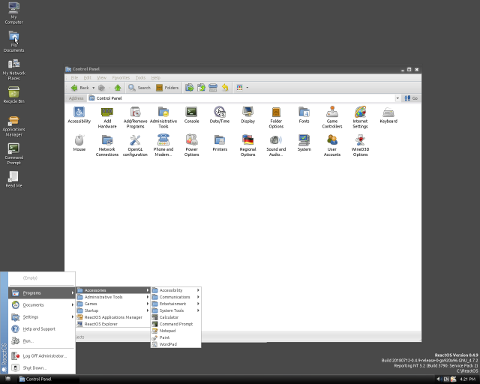 Both branches feature the KDE Plasma desktop.